Francisco Conesa Fernández, a Spanish mechanic, created Talleres Conesa in 1927. The company beginnings were a small family run workshop, located in Pedro IV Street, Poble Nou, in Barcelona. Their purpose was the production of devices for the fabrication of glass bottles. Initially, the company specialised in the fabrication of moulds. Thanks to their success and experience, both the company’s know-how and technology were improved and production expanded to manufacture machines for the mass-production of bottles. Sales covered all of Spain. Expansion and diversification of production lead to the inclusion of moulds for Bakelite products and to the development of their own lines of products: switches and plugs. During the Spanish Civil War, from 1936 to 1939, workshops in the big cities under the control of the anarchistic trade union CNT were made to manufacture spare parts for weapons during times of war. Talleres Conesa was no exception. After the Civil War, the company continued to produce switches and plugs under the FranCon brand, (derived from Francisco Conesa). Unfortunately, the brand sounded much like the name of the ruler (Francisco Franco). The pro-Franco government considered the brand insulting and a slow- down of the distribution of the products followed. Francisco Conesa Fernández then decided to resume production of moulds, their initial speciality. This time, however, the moulds produced were aimed at the metal parts industry, instead of the glass industry. They specialised in the production of dice for aluminium die-casting and for cutting and stamping metals. Talleres Conesa became dice suppliers for ‘Pegaso’, the Spanish truck and sport cars manufacturer established in Spain the year 1940. Other customers included SEAT (stamping and cutting dice) and, for a period of time, Renault in Valladolid. In 1986, Francisco Conesa Jové, son of Francisco Conesa Fernández, was appointed General Manager for Talleres Conesa. Since then and alongside dice manufacture, the production of precision tools and jigs for parts mounting and checking was added to the Company’s portfolio. 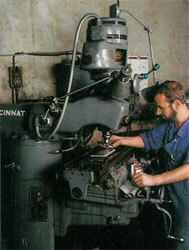 In 1998 Tecnomatrix was established with the purpose of increasing the machinery capacity of Talleres Conesa. As the matrix market collapsed in Western Europe, Talleres Conesa began to dedicate itself to the production of checking fixtures, for which there was a more promising and less competitive market. David Blas Pérez (see picture below) has been with the company since 1972, and is currently Production Manager for Tecnomatrix. He is the only member of Tecnomatrix that has worked for three generations of the Conesa family, and we are happy to have had him with us for all these years. In 2005, Francisco Conesa Jové retired, and his two sons, Xavier and Ignasi Conesa Foix, became the managers for the company. Both of them worked for the Barcelona Technology Centre (Barcelona Centre de Tecnologies–BCT), thus contributing to the company a wealth of technical knowledge that helped developing and expanding the company’s new star line of products: Dimensional Checking Fixtures.